Hart Lee Dykes was a beastly athlete as a child, winning the Pass, Punt, Kick Competition and becoming an All Star high school receiver out of Bay City Texas, that was even documented in Sports Illustrated. A highly lauded recruit, Dykes would become the subject of a well documented bidding war between college programs to land him, and the ensuing brouhaha would land him squarely in the middle of a college football corruption scandal. Surviving the scandal and granted immunity in exchange for his testimony, he’d be drafted by the New England Patriots out of Oklahoma State in 1989. 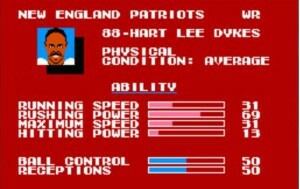 Hart Lee would also be the highest rated wide receiver taken out of this infamously deep draft with the 17th overall pick. (Eric Metcalf was drafted by the Browns three picks ahead of Dykes but as a runningback.) Dykes’ rookie season seemed promising enough, playing in all 16 games and starting 8, lodging 49 receptions for 795 yards and 5 touchdowns, but he’d be overshadowed by fellow rookie Andre Rison in Indianapolis. In 1990, Dykes season appeared to be off to a good start but he’d shatter his kneecap, effectively ending his career. After being placed on injured reserve, he’d attempt a comeback over the next season or two, but his situation was only complicated by a bar room altercation with teammate Irving Fryar where Dykes would have his eye socket shattered in the fight. 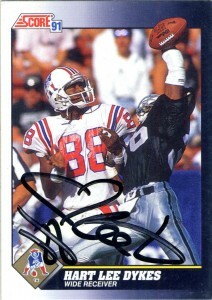 Shortly before he was cut, I got his autograph on this score 1991 card. At last glance the former Bay City, Texas resident had dabbled in real estate and was in the trucking business. Well when your name is Hart Lee Dykes, you’ve got to come up with a clever autograph, so it makes perfect sense that he used a heart for his first name in a fun autograph with lots of loops and curves. At the time of his graduation from OSU, Dykes was the All-time leader in the Big 8 for receptions (203) and yards (3171), however sadly still has not been recognized by the school, possibly due to his involvement in OSUs recruitment scandal.